Please give me some feedback on my store. I would appreciate any advice and/or critique on my store... I'm still busy adding products to the store, but so far I think it's about ready to be launched. On first impression, wow! I am impressed. It's neat, well organized, and branded well. The theme is very clear and your front page has a wonderful setup. Your products and collections are well organized, and the personal story on the bottom is perfect! To offer some feedback, first I would suggest highlighting one product on your front page. Even though all your products are awesome, it will make an easier sales funnel for your customers to follow. Next, I think you should take some time to rework your product descriptions and titles. They are neat, but not compelling enough for me personally to hit the add to cart button. Although details are important, I'd suggest keeping a maximum of one or two and deleting the rest. 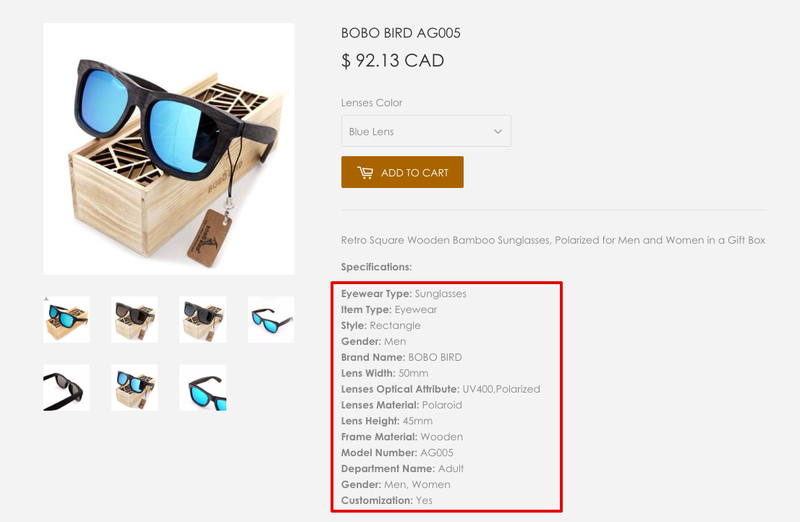 Here is a short guide I wrote to writing fast and easy product descriptions. Otherwise I'm really looking forward to the start of your store. I think you did a wonderful job and excited to see it succeed! Do you perhaps have any recommendations with regards to the amount of products I should have on my store? I'm also thinking of dropping the "Wooden Home Decor" collection to narrow down the niche even further... I think this could become a niche store on it's own... Your thoughts on this? I'm thinking of adding a collection that's more relevant to the sunglasses and watches, or maybe even to leave it at that...??? Thean Also, what exactly do you mean by "highlighting one product on my front page" and that "it will make an easier sales funnel for your customers to follow"?? So happy to hear you found the feedback helpful. When I mentioned highlighting a product, I meant that you should have one product be a focus on the front page. Right now, there is choice of collections to choose from as soon as I open it. These decisions make it take too long to hook someone's attention and they may leave the page. Right under the banner (or in it) you want to have an item that makes the customer think "wow!" and is more inclined to see what other amazing products and offers you have. For the amount of products, it really depends on you. However, we have found most successful stores have 1-3 products that are their best sellers and another 5-10 as filler to start. Once you grow your business and traffic you can start introducing more products! In terms of editing out the home decor, I think that makes sense to have a more focused niche. However, I think the most important thing is to get started! If you get started and see no one is buying home decor, then remove it. Hope this helps! Thank so much Magda, I appreciate your advice. wow!!! dude, im serioulsy jealous. It look so professional. I love the sleek design. I might seriously consider buying from you. The only i'd suggest is remove the brand logo in the background by photoshop. I've watched a few oberlo videos and people have suggested that. If they know the brand they'll just go to another website and look up the price. Also, speaking as a female, sometimes I get tired of all the glitz and glamor (rhinestones etc) and I like a nice simple, wood finish so your product definitely speaks to me. I'm only selling this one brand, I liked it from the start.. They offer a few products where I can put my own branding on it, so this is the goal for the near future, I just want to make a few sales and get into profit, then I'll take it to the next level. I wanted to find out how it is going? I’m also from South Africa and am drop shipping in to the USA and UK - planning to anyway. May I ask how much you budgeted for startup costs and if you could share any learnings? Thanks and wishing you the best of luck!